Want Your Very Own Bootstrappers Breakfast Mug? Home/Uncategorized/Want Your Very Own Bootstrappers Breakfast Mug? 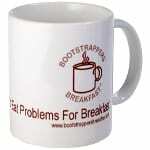 If you can’t find one at a neighborhood rummage sale in the or in the bargain bin at the Desk Depot you can order your very own Bootstrappers Breakfast® mug today from CafePress. Cup is 3.75″ tall and 3″ in diameter with a large, easy-grip handle, it is dishwasher and microwave safe. No garage should be without one. You can have it any any color you like as long as you like white or have a vivid imagination, and let’s face it if you are bootstrapping you have to be blessed with a vivid imagination. Can be used for hot or cold beverages not only in the morning but all day and all night. If you are tired of eating your problems for breakfast we have documented cases of entrepreneurs drowning smaller problems in a cup full of cold coffee. Some have been able to dissolve medium size problems in a cup full of Everclear (caution: Everclear may remove decorative logo and/or witty tag line from outer surface of cup). It’s also possible to dip your problems in a cup full of cocoa to improve their flavor before eating.